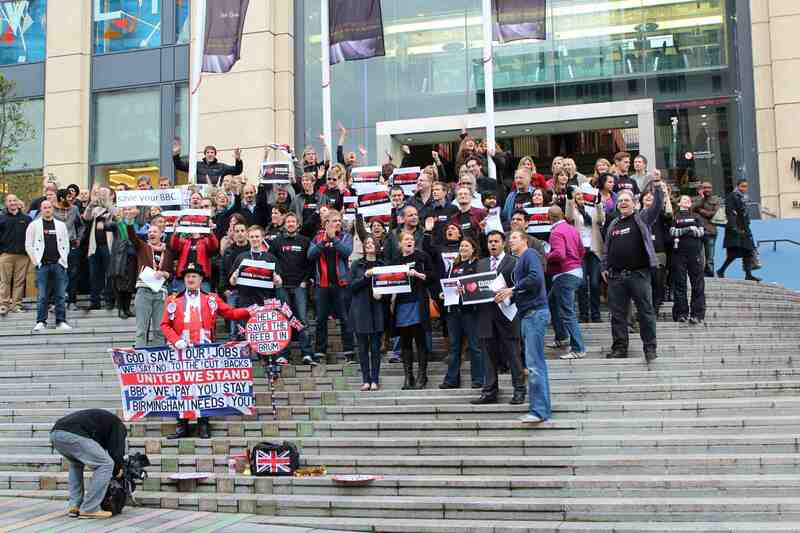 Staff of BBC Birmingham were protesting this lunchtime on the steps of the Mailbox against the closure of factual television and radio network production. Flagship series like ‘Gardeners’ World’, ‘Coast’ and ‘Countryfile’, are scheduled to move from BBC Birmingham to Bristol from August 2012. Production staff face redundancy or relocation, whilst post production staff look likely to be made redundant, as BBC Bristol does not have its own post production facilities. The number of staff and programmes made at BBC Birmingham has been being run down since the move from BBC Pebble Mill in 2005, and the commissioning guarantee from London has been quietly forgotten, eroding the production base. When Pebble Mill was at its height there were around 1,500 staff. The number now at BBC Birmingham is only a couple of hundred.